RDL Rack-Up series are 1/3 rack-width, rack-mounting modules, 1U high, offered with a wide range of functionality. Some Rack-Up modules are constructed in solid, encapsulated, durable, industrial, black plastic enclosures; Max Rack-Ups are assembled using heavy-duty, extruded-aluminium and steel panels. The rear panels have 'clear bold white lettering' for the terminal blocks and connectors. Reverse-printed, front-panel, poly-carbonate laminates provide a durable finished appearance for rack-mounted or free-standing use. Certain Rack-Up modules are often used free-standing; all Rack-Ups may be rack mounted by means of a range of mounting options. Compatible with RDL Format-A twisted-pair products, these models are RDL Format-A receivers that interface with a DANTE-enabled network. The Format-A RJ45 input has three audio channels which are converted to Dante networked digital audio channels. A fourth, balanced or unbalanced, line-level, auxiliary input is also converted to DANTE. They are offered with or without a POE (power over Ethernet) facility. DANTE is a software and hardware solution, offering high-performance audio distribution over standard IP networks, supporting hundreds of simultaneous channels of uncompressed audio with low latency and accurate synchronisation. For further information, see DANTE Networking Basics. The Radio Design Labs Format-A system uses standard IT networking cables to send, receive and distribute audio signals. As a result, systems may be installed in existing buildings using the existing 'flood' wiring, thus avoiding the cost, damage and consequent making-good of installing fresh cable. For further information, see RDL Format-A System. On the rear, the Format-A input connector provides up to 200mA of power to connected Format-A senders. Multiple senders may be loop-connected; they may be connected near the receiver or 'up to several thousand feet distant'. The power feeding the Format-A RJ45 connector is separately protected by an automatically resetting fuse. A power LED is associated with the connector, facilitating identification of wiring faults. A further RJ45 connector provides an Ethernet connection; the auxiliary input is a detachable terminal block. Power is connected using another detachable block and a coaxial inlet. Format-A input connector: RDL Format-A RJ45, pairs A, B, C.
Balance: Better than 90dB CMRR, 50Hz to 120Hz. Balance: Better than 60dB CMRR, 50Hz to 120Hz. Optional accessories: See RDL Rack-Up Mounting Accessories for a variety of mounting panels, trays, brackets and adapters. 57-402, an 'RDL PS-24AX POWER SUPPLY Universal, 24 volt, 500mA, UK plug' is a suitable power supply. The RU-FN is powered from an external 24V DC power supply, available separately. The external supply powers the RU-FN and Format-A senders connected to the Format-A input. 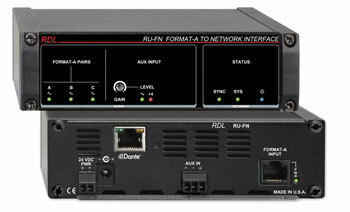 The RU-FNP is equipped for POE, which powers the RU-FNP and the connected Format-A senders. If POE power and an external 24V DC supply are both feeding an RU-FNP, the unit will run from the external supply and will seamlessly switch over to POE power upon loss of the external supply. POE relies on the use of a POE enabled network switch. The RU-FNP will reserve power from the switch even while being powered from an external 24V DC supply. These RDL Format-A 'sender/distributors' provide an interface between a DANTE audio network and RDL Format-A twisted-pair products. Three of the DANTE audio channels to are converted to RDL Format-A outputs. A fourth DANTE channel is converted to a balanced, line-level, auxiliary output. They are offered with or without a POE (power over Ethernet) facility. The front-panel has a 'signal' LED corresponding to each of the four DANTE input channels. Received audio level is indicated on these variable-intensity LED indicators, facilitating setup when a networked computer is not connected at the location of the module. On the rear, the three Format-A outputs are distributed to three separate RJ45 connectors; each output connector provides up to 200mA of power to connected Format-A receivers. Multiple senders may be loop-connected; they may be connected near the receiver or 'up to several thousand feet distant', but some higher-current Format-A receivers should be connected individually to a separate output socket. The power feeding each of the Format-A RJ45 connectors is separately protected by an automatically resetting fuse. A power LED is associated with each connector, facilitating identification of wiring faults. A further RJ45 connector provides an Ethernet connection; the auxiliary input is a detachable terminal block. Power is connected using another detachable block and a coaxial inlet. Format-A output connectors: 3x RDL Format-A RJ45, pairs A, B, C on each. Noise: Less than -85dB with output active, -100dB with output muted, below +4dBu. The RU-NFD is powered from an external 24V DC power supply, available separately. The external supply powers the RU-NFD and Format-A receivers connected to the Format-A outputs. The RU-NFDP is equipped for POE which powers the RU-NFD and the Format-A receivers connected to the primary Format-A output socket. Audio is also distributed to the other two output sockets. Remote Format-A receivers connected to those other two output jacks are only powered from the RU-NFDP if an external 24V DC power supply is connected. If POE power and an external 24V DC supply are both feeding an RU-NFDP, the unit will run from the external supply and will seamlessly switch over to POE power upon loss of the external 24V supply. POE relies on the use of a POE enabled network switch. The RU-NFDP will reserve power from the switch even while being powered from an external 24V DC supply. These modules interface standard line-level audio signals with a DANTE audio network, providing 'flexibility, economy and simplicity' to DANTE networked audio systems. Built in RDL's 'Rack-Up' packaging, they will mount directly to surfaces or using a range of mounting options. Each provides line-level outputs from two or four DANTE network audio channels. They are offered with or without a POE (power over Ethernet) facility. Noise: Less than -80dB with output active, -95dB with output muted, below +4dBu. The models differ principally in the number of DANTE channels interfaced and powering arrangements. The RU-NL2 provides line-level outputs from two DANTE channels. It is powered from an external 24V DC power supply, available separately. 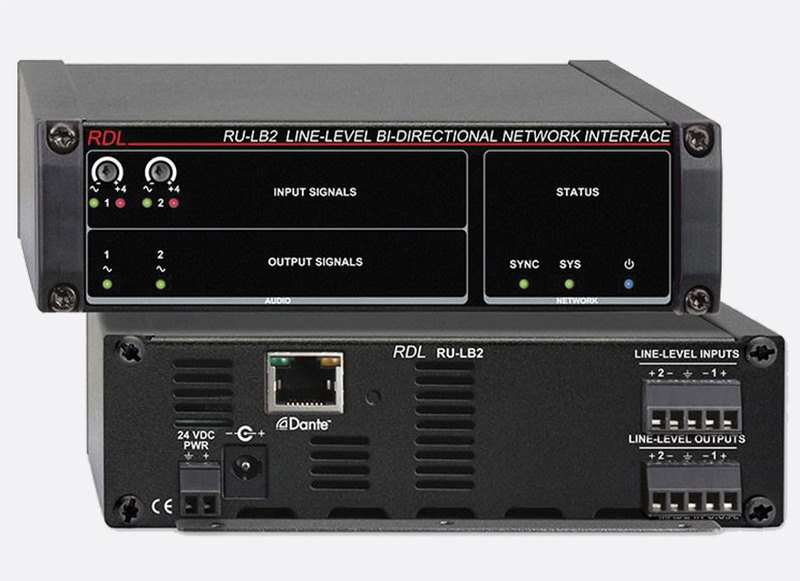 The RU-NL2P provides line-level outputs from two DANTE channels. It is equipped to operate from a POE-enabled network switch. It will reserve power from the switch even while being powered from an external 24V DC supply. If POE power and an external 24V DC supply are both feeding an RU-NL2P, the unit will run from the external supply and will switch over to POE power upon loss of the external supply. 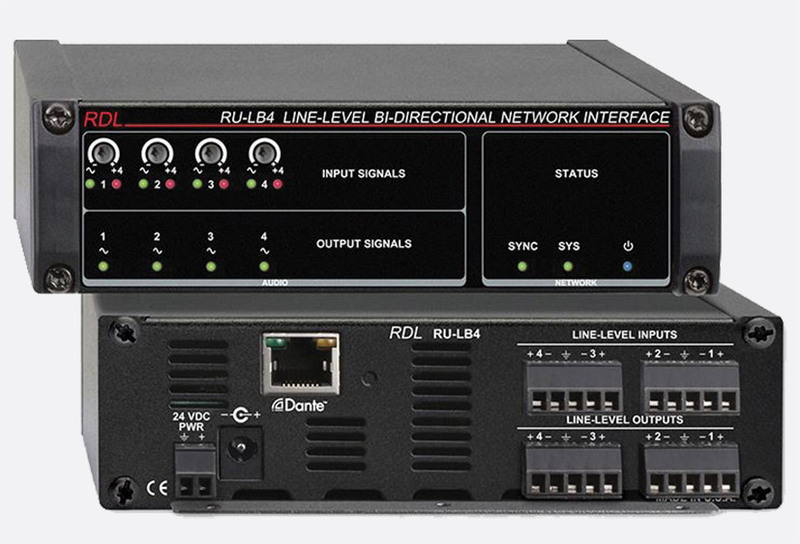 The RU-NL4 provides line-level outputs from four DANTE channels. It is powered from an external 24V DC power supply, available separately. 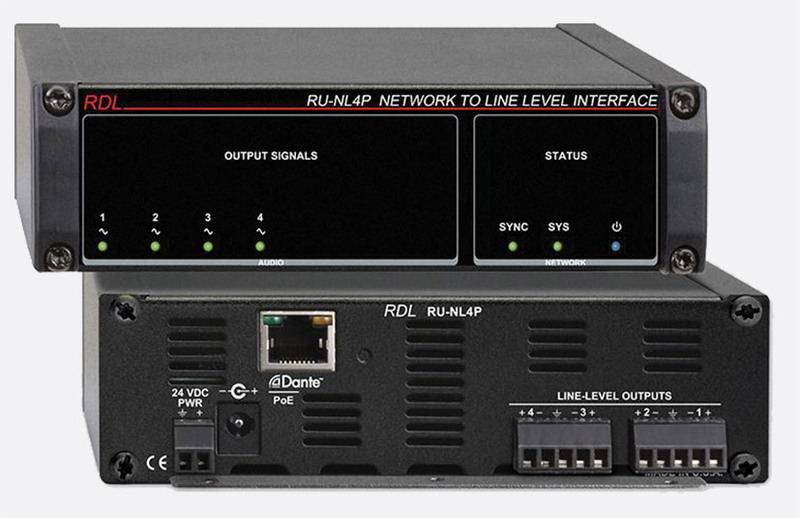 The RU-NL4P provides line-level outputs from four DANTE channels. It is equipped to operate from a POE-enabled network switch. It will reserve power from the switch even while being powered from an external 24V DC supply. If POE power and an external 24V DC supply are both feeding an RU-NL4P, the unit will run from the external supply and will switch over to POE power upon loss of the external supply. Compatible with RDL Format-A twisted-pair products, these models are both RDL Format-A receivers and RDL Format-A senders that interface with a DANTE-enabled network. A Format-A RJ45 input has three audio channels which are converted to Dante networked digital audio channels. A fourth, balanced or unbalanced, line-level, auxiliary input is also converted to Dante. Three of the DANTE audio channels are converted to RDL Format-A outputs. A fourth DANTE channel is converted to a balanced, line-level, auxiliary output. They are offered with or without a POE (power over Ethernet) facility. The modules provide all the features of an RDL RU-FN(P) Format A to Network Interface and an RU-NFD(P) Network to Format-A interface. On the rear, the Format-A input connector provides up to 200mA of power to connected Format-A senders. Multiple senders may be loop-connected; they may be connected near the receiver or 'up to several thousand feet distant'. The power feeding the Format-A RJ45 connector is separately protected by an automatically resetting fuse. A power LED is associated with the connector, facilitating identification of wiring faults. A further RJ45 connector provides the single Ethernet connection used to send and receive; the auxiliary input is a detachable terminal block. Power is connected using another detachable block and a coaxial inlet. On the rear, the three Format-A outputs are distributed to three separate RJ45 connectors; each output connector provides up to 200mA of power to connected Format-A receivers. Multiple senders may be loop-connected; they may be connected near the receiver or 'up to several thousand feet distant', but some higher-current Format-A receivers should be connected individually to a separate output socket. The power feeding each of the Format-A RJ45 connectors is separately protected by an automatically resetting fuse. A power LED is associated with each connector, facilitating identification of wiring faults. The auxiliary output is a detachable terminal block. The RU-BNF is powered from an external 24V DC power supply, available separately. The external supply powers the RU-BNF, Format-A senders connected to the Format-A input jack and Format-A receivers connected to all three Format-A outputs. 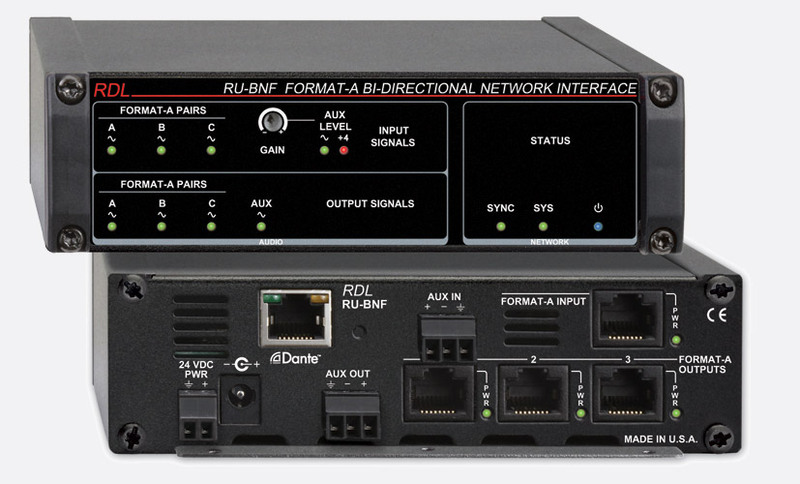 The RU-BNFP is equipped for POE which powers the RU-BNFP, the Format-A senders connected to the Format-A input, and the Format-A receivers connected to the primary Format-A output connector. Audio is also distributed to the other two output connectors. Remote Format-A receivers connected to these other two output connectors are only powered from the RU-BNFP if an external 24V DC power supply is connected. If both POE power and an external 24V DC supply are feeding an RU-BNFP, the unit will run from the external supply and will seamlessly switch over to POE power upon loss of the external 24V supply. POE relies on the use of a POE-enabled network switch. The RU-BNFP will reserve power from the switch even while being powered from an external 24V DC supply. These modules interface standard audio signals with a DANTE audio network, providing 'flexibility, economy and simplicity' to DANTE networked audio systems. Built in RDL's 'Rack-Up' packaging, they will mount directly to surfaces or using a range of mounting options. Each provides either line-level or microphone/line inputs and line outputs from two or four DANTE network audio channels. They are offered with or without a POE (power over Ethernet) facility. DANTE is a software and hardware solution, offering high-performance audio distribution over standard IP networks, supporting hundreds of simultaneous channels of uncompressed audio with low latency and accurate synchronization. For further information, see DANTE Networking Basics. The models differ in that there may be either two or four microphone/line or line level connections provided, two or four DANTE channels interfaced and powering arrangements. In the case of the microphone/line models, each input has a switch to select microphone or line level. No other user or installer gain adjustments are required since automatic microphone gain is provided, of 40dB for condenser microphones and 60dB for dynamic types. P48 Phantom is power is provided on each microphone input. The RU-LB2 provides line-level inputs and outputs, to and from two DANTE channels. It is powered from an external 24V DC power supply, available separately. The RU-LB2P provides line-level inputs and outputs, to and from two DANTE channels. It is equipped to operate either from an external, 24V DC, power supply, a suitable supply is available separately, or by a POE-enabled (power-over-Ethernet) network switch. It will reserve power from the switch even while being powered from an external 24V DC supply. If POE power and an external 24V DC supply are both feeding it, the unit will run from the external supply and will switch over to POE power seamlessly upon loss of the external supply. The RU-MLB2 provides microphone/line-level inputs to and line-level outputs from two DANTE channels. It is powered from an external 24V DC power supply, available separately. The RU-MLB2P provides microphone/line-level inputs to and line-level outputs from two DANTE channels. It is equipped to operate either from an external, 24V DC, power supply, a suitable supply is available separately, or by a POE-enabled (power-over-Ethernet) network switch. It will reserve power from the switch even while being powered from an external 24V DC supply. If POE power and an external 24V DC supply are both feeding it, the unit will run from the external supply and will switch over to POE power seamlessly upon loss of the external supply. The RU-LB4 provides line-level inputs and outputs, to and from four DANTE channels. It is powered from an external 24V DC power supply, available separately. The RU-LB4P provides line-level inputs and outputs, to and from four DANTE channels. It is equipped to operate either from an external, 24V DC, power supply, a suitable supply is available separately, or by a POE-enabled (power-over-Ethernet) network switch. It will reserve power from the switch even while being powered from an external 24V DC supply. If POE power and an external 24V DC supply are both feeding it, the unit will run from the external supply and will switch over to POE power seamlessly upon loss of the external supply. The RU-MLB4 provides microphone/line-level inputs to and line-level outputs from four DANTE channels. It is powered from an external 24V DC power supply, available separately. 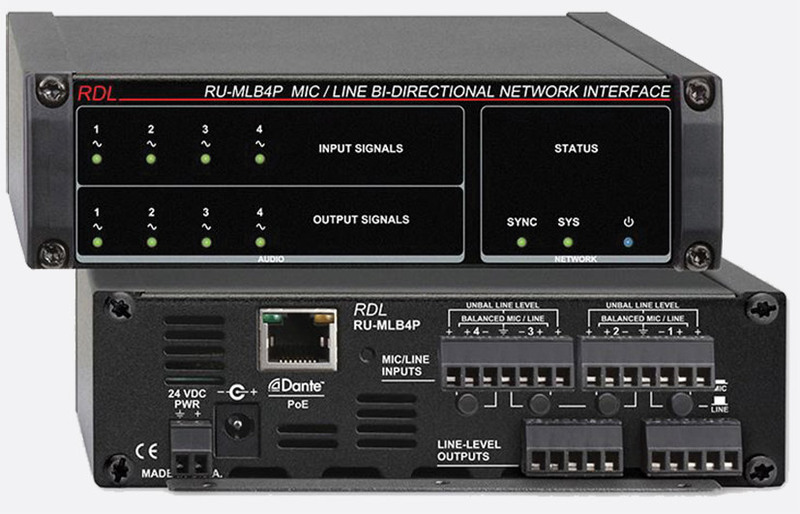 The RU-MLB4P provides microphone/line-level inputs to and line-level outputs from four DANTE channels. It is equipped to operate either from an external, 24V DC, power supply, a suitable supply is available separately, or by a POE-enabled (power-over-Ethernet) network switch. It will reserve power from the switch even while being powered from an external 24V DC supply. If POE power and an external 24V DC supply are both feeding it, the unit will run from the external supply and will switch over to POE power seamlessly upon loss of the external supply. This active audio sender and distribution module has three balanced or unbalanced line-level inputs on screw terminal connections, along with four outputs on RJ45 connections with Format-A compatibility. Front panel LEDs indicate the levels of each input pair whilst a blue LED to the bottom right of the front panel signifies 24Vdc power. Green LEDs positioned on the rear panel illuminate when the correct output voltage is sensed on the RJ45 connections. Four-channel mono audio mixers in the popular RDL modular Rack-Up formats. Different models have four or five channels, microphone/line and line input types are offered. Powering is by external 24V DC supply. Accessories are available for use from AC supplies, and to mount the mixers in a variety of environments. A four-channel mixer with expansion capability. Each channel has XLR and RCA (phono) connectors, for balanced microphone and unbalanced line inputs respectively, 24V phantom power switch, dual-LED level indicator and single rotary fader. A further unbalanced RCA (phono) connection provides a direct input to the mix amplifier for cascading mixers. The mix is displayed on an eight-LED VU meter and a soft-knee compressor may be switched in/out on the rear panel. The main output uses a balanced XLR connector, and an RCA (phono) provides unbalanced output. Both outputs follow a master output level control. The XLR output may be switched between microphone and line level. The RU-MX4T version has an output transformer for isolation. Microphone inputs: -58 to +20dBu (phantom off) or -41 to +4dBu (phantom on) for +4dBu output, 2kohms, balanced, 80Hz high-pass filter. Line inputs: -25 to +20dBV for +4dBu output, -10dBV nominal, 20kohms, unbalanced. Response: Microphone 80Hz-30kHz +/- 1.5 dB, -10dB at 20Hz (high-pass filter); line 20Hz-30kHz, +/- 0.25dB. Distortion: Better than 0.1% (80Hz to 20kHz), microphone, 0.02% line, THD plus noise. Noise: Better than -82dB for four line sources at unity gain, -64dB for four microphone inputs at 60dB gain, wideband, referred to +4dB output. Outputs: +4dBu, 150ohms, balanced and -10dBV unbalanced. Power source: 24V DC, 150mA, ground-referenced. Dimensions: 150 x 122 x 43 (l x d x h) mm. These modules are Max Rack-Up format, where depth changes depending on function of the module. Included accessories: Datasheet and power interconnection cable to cascade power to another module. Optional accessories: UK Plug-top power supplies, see Friwo Plug-top Power Supplies for more details. 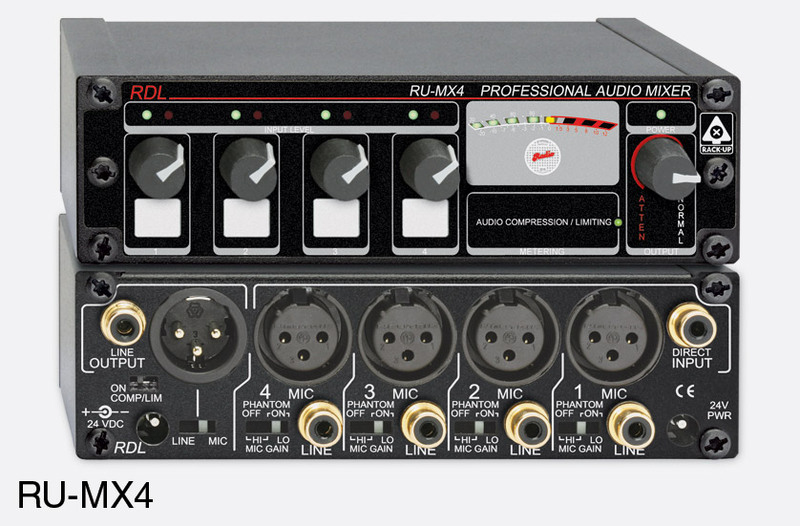 This has four balanced, line-level inputs instead of the four microphone inputs of the RU-MX4. There is no phantom power or compressor, and hence, the associated switches, but is otherwise similar to the RU-MX4. Specification mostly as RU-MX4. Balanced inputs: -13 to +22dBu for +4dBu output, 20kohms. Distortion: Better than 0.01%, THD plus noise. A five channel mixer with detachable barrier block terminals for connection, aimed at permanent installation. Four inputs channels each have microphone and line input terminals, one of which is used at a time. The fifth input is line level only. Microphone inputs are intended for low-impedance balanced types although high-impedance unbalanced types may also be used. Line inputs are balanced, but may be connected unbalanced. Phantom power, 24V DC, may be jumpered to any or all microphones. Each channel has a rotary gain control. There is a separate unbalanced mix input for cascading mixers and similar applications. There are two balanced outputs, one microphone level, one line level. Two peak-reading LED indicators provide output metering. Microphone inputs (max): -20dBu for +4dBu output, >1.2kohms, balanced. Line inputs: +24dBu for +4dBu output, -10dBV nominal, >10kohms, balanced. Response: Microphone 80Hz-40kHz +/- 1.0 dB; line 10Hz-35kHz, +/- 0.5dB. Distortion: Better than 0.03% (mic), 0.003% (line), THD. Noise: Better than -70dB, all channels active, microphone gain at 50dB, line gain at unity, referred to +4dB output. Outputs: +4dBu, 150ohms, balanced (line), and -45dBu, 150 ohms, balanced (mic). Power source: 24V-33V DC, 65 mA, ground-referenced. Dimensions: 150 x 122 x 43 (l x d x h) mm. Optional accessories: As RU-MX4. Note that these modules are standard Rack-Up format. This passive unit features two separate, passive isolated channels. A single input connector is provided for each attenuator. The output connector is intended to be connected to a 75 ohm terminated load. A front-panel knob is provided to adjust video levels down to the normal 1-volt p-p signal level. A single attenuator is capable of adjusting down the video level to half the incoming signal level. In situations where excessive video levels may cause input overload effects, the RU-VA2 is easily inserted into the circuit and adjusted for proper video levels. Mono and stereo (RU-VCA2D) digitally controlled amplifier with ramp generator output. When used with RLC1 or RLC2, push button “up” and “down” level control is provided as well as a return to preset function when both buttons are pressed simultaneously. A 2 × 4 stereo or 1 × 8 mono audio distribution amplifier offering independent level adjustments for each of the balanced outputs, audio present and peak led indicators, and multiple isolated audio feeds. The inputs and outputs are connected on rear-panel detachable phoenix-style terminal blocks. As per RU-ADA4D however capable of 2 x 8 stereo or 1 x 16 mono. For applications where connectorised, 4-channel, balanced mic or line level audio distribution is needed. The input and output connections are provided on the front panel as XLR and the rear panel as full-sized detachable barrier blocks and can wired balanced or unbalanced. The outputs are 150 ohms balanced, designed to drive short or long balanced lines, with each output switchable between mic and line level. Both the front panel input XLR connector and the rear panel input terminals are active at all times and are switchable between mic (high and low gain) and line level. Gain trim is provided on a front panel control, along with dual-LED metering, thus accommodating a wide variety of dynamic or condenser microphones as well as line level setup. 24V phantom power can also be selected for the microphone mode input. As per RU-MLD4 however includes transformer. This unit features two separate, isolated channels. 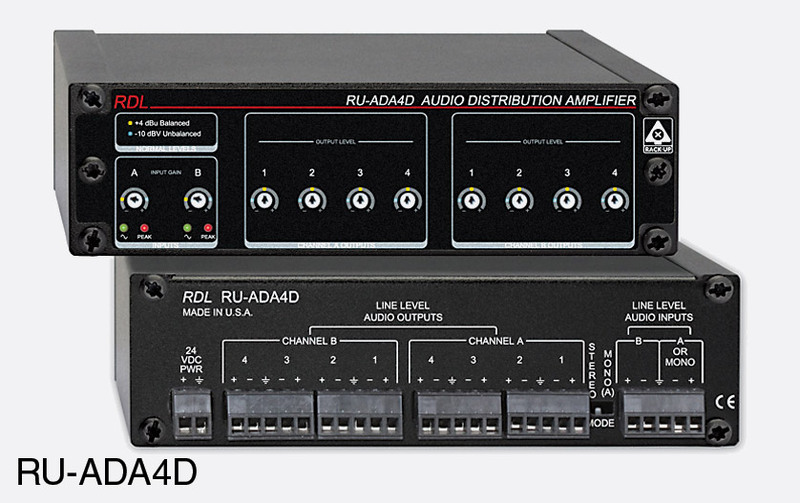 The RU-UDA4 may be used in stereo applications, or as two individual mono distribution amplifiers. The input signals are buffered through output line drivers, providing 4 separate line-level unbalanced outputs for each of the two inputs. The RU-UDA4 performance is tailored around industry standard –10dBV input/output levels. RU-VDA4B contains a 4 way distribution amplifier, each output capable of 1V peak to peak video signal into a terminated load. An indicator is provided to show the presence of such a signal. The input is a bridging type, with associated loop through output. Input gain is adjustable by means of a preset front panel control. All video connections are made using front panel BNC jacks, whilst the rear panel has barrier strip terminals for the necessary power input: 24V DC, 60mA nominal, (36V DC max). For suitable power supplies see separate entry. This unit is part of a range of modules, mostly concerned with audio, which may be mounted up to 3 modules wide in a standard 19inch rack. For mounting hardware see main Radio Design Labs “Rack-up” circuit modules entry (see index). Input: 1 kohm (to bridge 75 ohm line). Gain: –1dB to +7dB. Load impedance: 75 ohms. Frequency response: 10Hz–10MHz ±0.2dB. Noise: <70dB below 1V p-p. Output isolation: >40dB. Differential gain: 0.1%. Differential phase: 0.1 degree. Video connections: BNC, unbalanced, ground referenced. Dimensions (WxHxD): 150×43×77mm. This delivers up to 9W RMS per channel into 4 ohms, or up to 18W RMS bridged mono into 8 ohms (switch selectable, both inputs are mixed together). Rear panel switchable built-in peak limiter, front panel volume controls for both inputs. This Rack-Up series headphone amplifier has balanced/unbalanced left/right inputs via rear-mounted terminal block, and single 6.3mm jack socket. The amplifier has an output of more than 50mW into either high or low impedance headphones, and can be controlled via a front facing rotary controller. Accepts input signal of -20dBV to +20dBu. The system can be wired in mono by using only the left input channel. This unit features two microphone or line level input and output preamplifiers which may be used in stereo applications, or as two individual mono preamplifiers. Inputs and outputs are available as front panel XLR and are also available on the rear panel barrier block. Features include input gain adjustment, mic/line selector switches for input and output, input level LED indicators (dual LEDs), mic input high/low gain selection. The outputs are low impedance balanced, designed to drive short or long balanced lines. Inputs and outputs can be wired balanced or unbalanced. 24V phantom power can also be selected for microphone inputs. As per RU-MLA2 however includes transformer. Single-channel three-band equalisers. RU-EQ3 has controls for bass and treble along with a mid-control “optimised to voice band adjustment”. A 2-channel horizontal LED array offering precision audio metering, precise left/right meter tracking, individual channel calibration controls, selectable peak or average metering for each channel, and peak hold on the upper three LED’s in either mode. As per RU-SM16A with four inputs and meters for quad-mono or dual stereo metering. Switches 4 signals to a single output. BNC connectors for inputs and loop-through for outputs of the source signals, or 75 ohms termination. Output is 75 ohm back-terminated to provide unity gain into a 75 ohm terminated input. Front panel has keyboard switches for source selection with LED tally, if the button for the active source is pressed, the switcher mutes to black. Vertical interval switching. A front panel local/remote toggle switch activates either the front panel buttons or a rear-panel connected remote control. Remote output controls are provided to control other equipment (eg. RU-SX4A Audio Switcher). Similar to the RU-SX4, this also features automatic sequence switching. On power-up, the unit sequences at the rate selected on the front panel interval rate control. If the button for an active source is pressed, the sequencing is stopped and that source is selected. If the button for an inactive source is pressed, the output switches direct to that source. Pressing the button a second time resumes the sequencing. Technical details as RU-VSX4. Similar to the RU-SX4, however the ASX4D switches 4 stereo audio inputs to a single stereo audio output. Each of the balanced inputs and outputs are on detachable terminal blocks positioned on the rear panel. The front panel hosts the four push button switches along with latching power button and LED level indicators. A sequential switcher providing control voltages for up to 6 circuits. Each circuit has a 24V DC output for switching mains relays etc. and an SPST dry contact for other control functions. Switch on and off delay is adjustable by front panel control. Controlled by either a front panel push-button or rear panel remote activation contact, the unit will also behave as if a power-up sequence is received on receipt of a supply voltage. It also powers off in sequence if that same supply is lost. LEDs indicate the 6 circuit states, if a power-up request is received, sequence complete status and whether the unit is in manual or remote control modes (switchable on the rear). Sequence completed and front panel or remote control. Powering: All units require a 24V DC power supply; each has both screw terminals and coaxial socket for power input. A ‘universal’ supply is available, 57-401, with 24V 2A output, which requires an IEC cord set. Note that all RDL modules with co-axial power input/output sockets use connectors with 2.5mm pins.